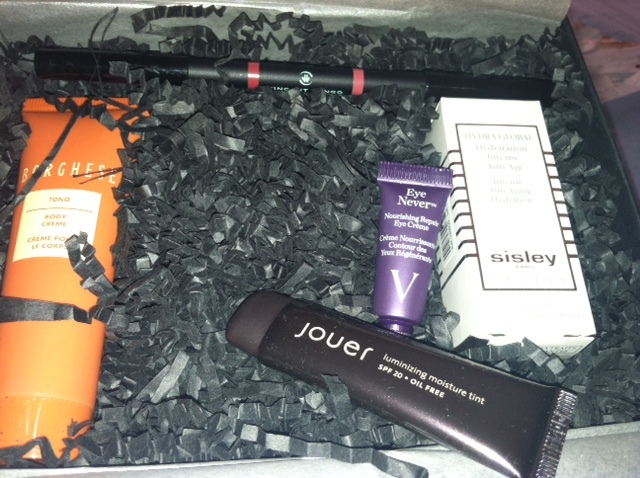 Sample Society is a subscription box that I previously belonged to. They recently contacted me because they wanted to know why I cancelled. I told them I felt the samples were too small, and the price too high for what was sent. They wanted me to try Sample Society again, so they sent me July's box . . . for free! Sample Society is from both Allue and Beauty Bar. You get two wonderful things besides the box. First, you get a 12 month subscription to Allure if you have a paid subscription. You also receive a $15 off $50 code to use at www.beautybar.com. The code is stackable with other codes they have available. I was really torn when I cancelled my box a few months ago. I really loved the box, and actually ended up using 2 products as a result (Murad and Dermalogica), but I felt it was a little too expensive. You pay $15 a month for the box, and there are generally 5 items in the box. Obviously, with just the one full sized item, this more than makes up for the $15 cost. The value is estimated at $54.32! Wow! I was just telling Mama Steph that I may sign up again, and I think this may just be the push I needed. Want to sign up yourself? This looks like worthy box. I'll have to look into it. Thanks for the info and nice review!